Come on May. You can do better than that. Why a week? Walk them straight to the door. If Trump keeps silent on this matter and there ever is such an attack in the USA he will share the blame. Nikki Haley warns of Russian chemical attack in U.S.
Nikki Haley is warning that Russia's apparent use of a chemical weapon in the UK could open the door to similar attacks in the U.S. The UN ambassador told a meeting of the UN Security Council on Thursday the U.S. agrees with British officials that a Russian defector and his daughter were likely poisoned by Russian agents in Salisbury, England, last week. It was the strongest accusation yet from an American official that Moscow was responsible for the use of "a military-grade nerve agent" — and a warning that other countries face the risk of similar actions on their own soil. "If we don't take immediate concrete measures to address this now, Salisbury will not be the last place we see chemical weapons used," Haley said. "They could be used here in New York or in cities of any country that sits on this council." U.S. goods and services trade with Russia totaled an estimated $27.2 billion in 2016. Exports were $10.3 billion; imports were $16.9 billion. The U.S. goods and services trade deficit with Russia was $6.6 billion in 2016. Time to slap tariffs on Russia? At least 26 forces use the laptop-size devices to extract emails, photos, passwords and conversations on encrypted messaging apps without using a password or thumbprint. According to Privacy International, a privacy rights charity, forces do not obtain warrants or seek permission from the people whose phones they search. The technology was first introduced by the Metropolitan Police for the London Olympics in 2012 and has been quietly rolled out. Privacy International’s report says police are operating without any clear legal framework and often break into phones belonging to people who have not been convicted of any crime, including witnesses and victims. BRIDE-TO-BE Meghan Markle will be forced to spill the Royal Family’s money secrets to the US taxman. Strict rules in America mean the 36-year-old must reveal any cash she receives from fiancé Prince Harry or the Queen when she files her tax return. The Independent Revenue Service will also demand to know the actress’s earnings from her Suits TV show, rumoured to be £50,000 an episode. And they will want details of any joint accounts she has with Harry. The prince’s spending will also go under the microscope as his fiancée will have to divulge any expensive gifts such as her engagement ring – said to be worth £100,000. Other secrets include if she is getting a “benefit in kind” by living at Kensington Palace with Harry without paying rent, and any money they have made since moving in together. Comment: I wonder if the bride will drop her US citizenship in favour of a British one. I would discount any reporting where the US's IRS is referred to as the Independent Revenue Service. Another boy - and a pretty healthy sized one at that. LONDON — Britain’s interior minister was fighting for her job Sunday as uproar spread over authorities’ mistreatment of long-term U.K. residents wrongly caught up in a government drive to reduce illegal immigration. Home Secretary Amber Rudd says she will stay in her job to ensure Britain’s immigration policy is “humane.” But opposition politicians demanded she resign over what has become known as the Windrush scandal. Rudd plans to make a statement Monday in the House of Commons about the scandal, which critics say reflects a hostile attitude to immigrants. They and subsequent Caribbean migrants came from British colonies or ex-colonies and had an automatic right to settle in the U.K. But some have been ensnared by tough new rules introduced since 2012 that are designed to make Britain a “hostile environment” for illegal immigrants. Legal migrants have been denied housing, jobs or medical treatment in Britain because of requirements that landlords, employers and doctors check people’s immigration status. Others have been told by the government that they are in Britain illegally and must leave. In recent weeks Rudd and Prime Minister Theresa May have apologized repeatedly to the Windrush generation, saying all pre-1973 Commonwealth immigrants who don’t already have British citizenship will get it, and those affected will get compensation. Considering the great flap not to mention the embarrassment to the current gov't, it really shouldn't be any great surprise. She didn't create the issue, but she didn't do anything about it once it became obvious ther was an issue, and Home Office attitude was a big part of the problem. Barnier warns of no Brexit deal without border backstop. The British government is understood to be about to settle a long-running compensation claim brought by a husband and wife who were the victims of a so-called rendition operation mounted with the help of MI6. Abdel Hakim Belhaj and his wife, Fatima Boudchar, have battled for compensation and an apology for more than six years, after papers that came to light during the Libyan revolution revealed the role that British intelligence officers played in their 2004 kidnap in Thailand. The attorney general, Jeremy Wright, is expected to make a statement to MPs on Thursday, and Belhaj, now a military commander in Libya, will make a statement in Istanbul shortly afterwards. It is unclear what the agreed terms are, although Belhaj has in the past said he would settle for just £3 – £1 from each of the defendants, as long as he and his wife also received an apology from the British government. The couple had been suing the former foreign secretary Jack Straw, and Sir Mark Allen, the former head of counter-terrorism at MI6, as well as the agency itself and the Foreign Office. The Commons foreign affairs committee said London was being used to hide the "corrupt assets" of President Vladimir Putin and his allies. It said it was "business as usual" for the UK despite the poisoning of Russian ex-spy Sergei Skripal and his daughter. This undermined the UK's efforts to confront the full spectrum of President Putin's offensive measures, it said. The UK's "lethargic response is being taken as proof that we don't dare stop them... London's markets are enabling the Kremlin's efforts," committee chairman and Conservative MP Tom Tugendhat wrote in the Sunday Times, ahead of the the publication of the report. Security and economic crime minister Ben Wallace said he had not been called to give evidence to the committee: "I fear such an omission weakens the foundation of the report," he said. Tories in power lead to this, Churchill notwithstanding. I wish Labour were more respectable nowadays. Labour is what happens when the Berniebros win. Sad to say that, but the parallels are pretty striking. Uh, that's not how its gonna work. Absolutely right Suranis. 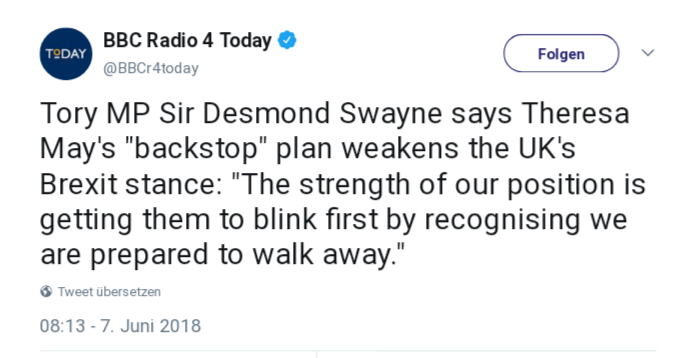 The Brexiteers appear to have the same negotiating skills as Trump and the same lack of understanding in seeing the other side's negotiators as weak and stupid enemies. They also appear to believe that bluster is a negotiating technique, whereas adults know that it just makes the other side roll their eyes and wait patiently for a glimpse of maturity. In general, the people on the other side of the negotiating table, both for Brexit talks and for Trump's trade talks, must be seen not as friends, not as enemies, but as partners. Occasionally they might be opponents, but usually they are partners looking for a mutually satisfactory outcome. According to Buzzfeed, he said that the prime minister was "going to go into a phase where we are much more combative with Brussels". He reportedly added: "You've got to face the fact there may now be a meltdown. OK? I don't want anybody to panic during the meltdown. No panic. Pro bono publico, no bloody panic. It's going to be all right in the end." On the US president, who is preparing for an historic summit with North Korea's leader Kim Jong-un, Mr Johnson reportedly said: "I have become more and more convinced that there is method in his madness."